There are lots of complaints about engine noise levels with the non-hybrid 2019 RAV. Is this also a problem with the hybrid version? Since no one in the US has driven one yet other than the Carmel CA reviewers, it's kinda hard to answer that from an owner's perspective, but all videos show the HV having a hood insulator, and in my experience after adding an HV hood insulator to my XLE Premium, it does reduce engine noise perceived from the cabin, I'd expect the same from the HV. The more prevalent issue with the HV is the eCVT will make it run at higher RPMs when under moderate power which results in kinda of a drone on HVs, it was very noticeable in my '16 Ltd HV although not objectionable due to the hood insulator it had. At the risk of redundancy, my wife’s 2017 Lexus es300h has a 2.5L 4-cylinder Atkinson motor coupled with electric motor(s) and eCVT producing 200hp, and it is a very quiet ride (I call it a Japanese Cadillac). 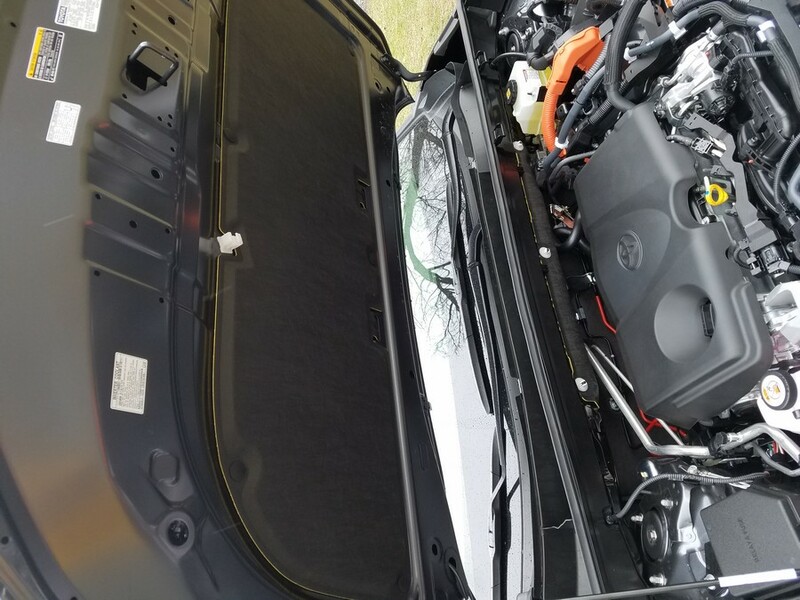 The 2019 rav4 hybrid has a 2.5l 4-cylinder Atkinson engine with 2 electric motors and eCVT producing 219hp. Perhaps Toyota on purpose let some of the engine noise hang out on the Rav in order to go with the sporty nature of the vehicle (especially the XSE model)? There are a number of POV (point of view) videos from Europe on YouTube of the 2019 Hybrid RAV-4, including one taking it to top speed (118 MPH). My impression from those videos is that the '19 Hybrid RAV 4 is quieter than the gasoline only version. Of course firsthand experience will be the ultimate indicator. Hopefully there will be some reviews posted once the Hybrids arrive at dealerships. Last edited by hcfd1075; 03-16-2019 at 10:08 AM. Reason: Add info. I just picked up (4-5-2019) a Rav4 Hybrid limited, it is very quiet compared to the SE Rav4. Replacing the wife's car and she had the pick of replacements. One minute into the SE test drive she stated it's too noisy. She stated that at least 4 times during the ride. A week later we saw another local dealer get a Rav4 hybrid. Drove it and were able to get a decent trade in, $3K off list (it was one of two that arrived the day before) and took it that day. Three other people were interested in it on the lot, wanted to sush them away ! At 40/38mpg and MORE powerful than the standard Rav4 according to the wife. I have a Sonata hybrid and this accelerates faster, but mine is always in ECO mode. Have to drive it more in ECO mode too and see how it accelerates. But my Sonata hybrid will get 44+ mpg, just being a FWD sedan. To answer the question, there is only one semi hard insulation in the hood on my hybrid. It is towards the back only 3/4 of the way to the front. It's not thick. I checked into this when we drove the SE version and heard the horrible reviews of the noise. Supposedly, that part is way on back-order, and as a dealer part way over priced. The HP numbers are published and we can compare the regular engine HP vs Hybrid HP. I sure would like to see the torque curves on a regular RAV4 vs a Hybrid. In everyday driving, torque, how quickly and low on the RPM band it is available is much more important (imo). Another drive, now at 155 miles. In town, it is silent. Very quiet on the highways. Interesting note (I have the limited), it has factory auto start via phone and FOB ! Right now getting 34 mpg, mostly hw, but hilly. Interesting note (I have the limited), it has factory auto start via phone and FOB. Remote start comes with the Entune Audio Plus and Premium infotainment systems, it's part of Remote Connect, works from the fob or the app on the phone, both options will end after the 6 month trial unless renewed, have you tried the remote window and moonroof open yet?